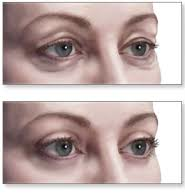 The procedure of upper eyelid lift is known as a blepharoplasty. This procedure removes excess skin fat and muscle from the upper eyelid to correct fullness or “hooding” of the upper eyelid. There are many reasons that people seek eyelid surgery that are both reconstructive and cosmetic. In the advanced form the lax skin of the upper eyelids can rest on the upper lashes and even obscure vision. In the less dramatic forms vision is not impeded but the excess skin and fat creates a tired and fatigued appearance to the eyes that can be corrected with surgery. There are several components that can contribute to the appearance of the upper lids including the position of the eyebrow, prominence of fat pads in front or behind the muscles of the eyelid, excess muscle tissue, looseness of the eyelid lifting muscle as well as excess skin. Your surgeon will carefully examine your eyelids and discuss with you the tailored steps that will be required to get the best appearance for your eyelids. The procedure can be done with local anaestheic alone or in combination with a sedation anaesthetic to ensure the most comfortable procedure. Your surgeon will discuss these options with you at your appointment. Any invasive surgical procedure involves scars. 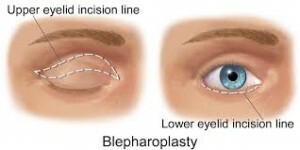 For blepharoplasty your surgeon will minimize these scars and place them so they will be hidden in the natural crease lines of the upper lid. The exact position of the scars will be discussed with you at your appointment. The outcomes from blepharoplasty surgery are very reliable. It produces a well defined line above the eyelid and a brighter more youthful contour to the eyelid and face. Blepharoplasty or “eyelid lift” relieves the fullness of upper and lower eyelids.